SAN FRANCISCO - Government moves to deport more than 13,000 men from Muslim countries who had registered with the authorities this winter sparked impassioned condemnation Friday during a boisterous protest rally in front of immigration headquarters in San Francisco. 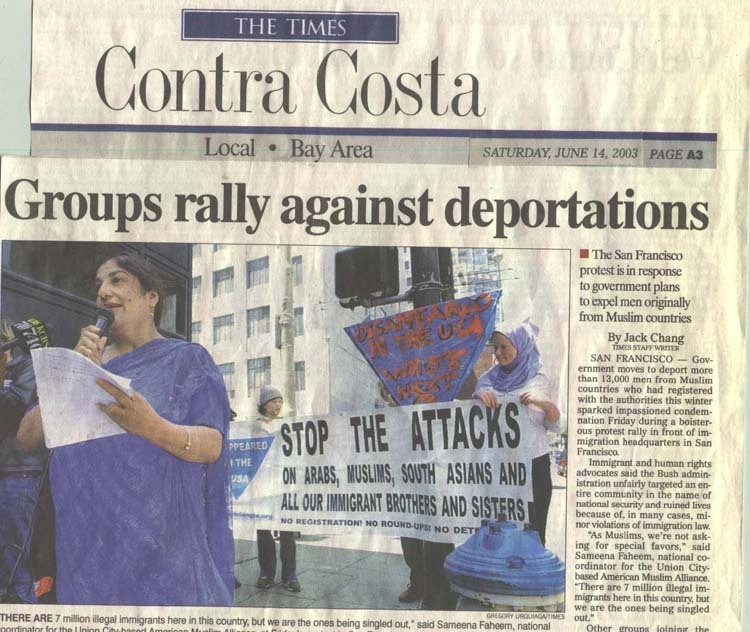 Immigrant and human rights advocates said the Bush administration unfairly targeted an entire community in the name of national security and ruined lives because of, in many cases, minor violations of immigration law. "As Muslims, we're not asking for special favors," said Sameena Faheem, national coordinator for the Union City-based American Muslim Alliance. "There are 7 million illegal immigrants here in this country, but we are the ones being singled out." Other groups joining the protest included the American Civil Liberties Union, Amnesty International and Justice for New Americans, an Oakland-based organization founded by defenders of Taiwan-born scientist Wen Ho Lee whom U.S. authorities accused of espionage but who was later cleared of most charges. "The U.S. government is using this detention policy to send a message to new Americans, regardless of race, color and country of origin," said Justice for New Americans president Cecilia Chang. "We're being treated as perpetual foreigners." Department of Homeland Security spokeswoman Sharon Rummery said the registration system, which drew 82,880 men into immigration offices for fingerprinting and other procedures, served as the kick-off of a nationwide entry-exit system that will eventually record the movements of all visitors. The recently completed registration process applied only to male visitors over the age of 16 from two dozen Muslim countries and North Korea. "These people are going to go before immigration judges and get a chance to argue their cases for staying in the country," Rummery said. "They are not immigrants. They don't have the immediate right to live here." But Asam Jaldoush, a Jordanian national of Palestinian descent, said the federal government was going out of its way to prosecute Middle Eastern men such as himself who were applying for legal residency but had broken immigration laws in the past. Speaking in front of the immigration headquarters, the 34-year-old said he planned to leave the country voluntarily rather than fight his deportation because "the way (immigration officials) treated me, I don't feel I'll get justice here. And it'll be 50 years before Muslims get apologies from the government like the Japanese got." The soon-to-be former San Franciscan said he registered with the government in March and was detained because he had lived illegally in the country from 1993 to 1995. He currently has legal permission to stay and is applying for his residency through his wife, said his attorney, Banafsheh Akhlaghi. "Everything was absolutely fine," Jaldoush said. "But they canceled my case on the spot and put me in removal proceedings." Jaldoush said he plans to fly to Detroit today and walk into Canada next week to declare himself a political refugee. Rummery said she could not talk about government policy involving people with temporary permission to stay while their cases are pending. She did say: "Just because you're applying for a benefit doesn't mean you'll get it."